From the international legal viewpoint, relevant is the Vienna Convention on the Law of Treaties (“VCLT”) and particularly Section 4 of its Part V (Articles 65-68). It provides a lex generalis procedure on withdrawal and possible revocation thereof, subject to specific regimes directly provided for in any other treaty (like the TEU). More precisely, under Article 68 VCLT «a notification or instrument provided for in article 65 or 67 may be revoked at any time before it takes effect». The literature on this VLCT proviso is really not abundant (but see Capotorti, 417 et seq., and, more recently, Helfer 2012, and Tzanakopoulos), but tends to construe it specifically in connection with article 65 VCLT. Such a provision disciplines claims by one State concerning the alleged invalidity of a treaty (Article 65.1). This claim is followed by a three-month period – or any shorter period indicated by the State in case of urgency – in which the receiving States are entitled to state objections to the claim (Article 65.2). If objections are raised, then the dispute must be solved through the usual instruments provided for by international law (Article 65.3). Sure enough, in this situation the expression «takes effect» can apply (a) to the elapsing of the three-months (or shorter) period without any objection being raised to the withdrawal notice; (b) to the settlement of the dispute which may have arisen as a consequence of the withdrawal notice and of the subsequent objection. As long as either (a) or (b) has not occurred, the uncertainty of the status of a treaty among ‘contending’ parties can be healed with the withdrawal revocation by the notifying State, this being tellingly a solution consistent with sound principles of international law based on peaceful settlement of disputes and legal certainty. In addition, article 65 requires the notifying State to state its claim and motivate it, in order to allow the other parties to the treaty to understand the reasons for the withdrawal and/or termination of such treaty, accept them or object to them. In turn, and again, the possibility of revoking the withdrawal notice is strictly connected with the persuasiveness of the withdrawing State’s arguments concerning the existence of legal grounds for claiming invalidity of the treaty, and points again to a potential dispute among the States parties to a treaty, which can be resolved also by means of a step back of the State who has initiated this process. Pursuant to Article 67.2, Article 68 VCLT applies also when the provisions of a treaty allow for withdrawal («Any act declaring invalid, terminating, withdrawing from or suspending the operation of a treaty pursuant to the provisions of the treaty or of paragraphs 2 and 3 of article 65 shall be carried out through an instrument communicated to the other parties»). But in this case, scholars correctly argue that the deadline for the revocation (i.e. the “taking effect” of the communication) is that of the receipt of such a communication by other parties (Capotorti, 571; Tzanakopoulos). It is true that this interval may be actually short, but the rationale of the revocation is to end uncertainty originating from the formal communication by one state that it does no longer wish to be a party of a treaty, and nothing else. Looking at international practice, in general withdrawal declarations are not revoked, unless accompanied by conditions, whose acceptance by the other parties to a treaty may trigger revocation. For instance, Norway gave a conditional notice of withdrawal from the 1946 Washington International Convention for the Regulation of Whaling, stating however that its primary objective was the conclusion of a quota agreement between five states engaged in pelagic whaling, and should that be achieved prior to 1 July 1962, the notice of withdrawal would be “cancelled”. In another remarkable case, when in 2002 the US withdrew from the 1972 Anti-Ballistic Missile (ABM) Treaty, the US first signalled its conditional intent to withdraw in accordance with the provisions of the treaty, and then gave the 6-month notice required by those provisions. The above practice is consistent with the reasons normally beneath a notice of withdrawal, i.e. (a) either to carry out a strategy to increase a State’s voice within an intergovernmental organization or treaty-based negotiating forum, or (b) as a law-promoting tool: «particularly given the international legal system’s relatively anarchic environment, in which surreptitious shirking of treaty obligations is often plausible, a state’s decision to follow the rules of the game, publicize a future withdrawal, and open itself to scrutiny demonstrates a kind of respect for international law» (Helfer 2005, at 1587). In both cases, conditioning a withdrawal serves exactly the purpose to achieve either of the above goals; and revocation is legitimate and necessary to allow the functioning of this “dynamic” mechanism. No doubt that the entire regime summarised above is based on – and consistent with – a paramount rule of international treaty law, codified also in Article 26 VCLT, under which «[e]very treaty is binding upon the parties to it and must be performed in good faith». Good faith performance mandates that if a State is willing to withdraw from a treaty, it must express its good reasons for this, and allow the other parties to evaluate whether amendments to the treaty are possible in order to overcome the problems evidenced by the intention of a State to withdraw from it. Revocation of withdrawal is strictly instrumental to the above objectives; and under the pacta sunt servanda principle cannot be interpreted to cover additional hypotheses. 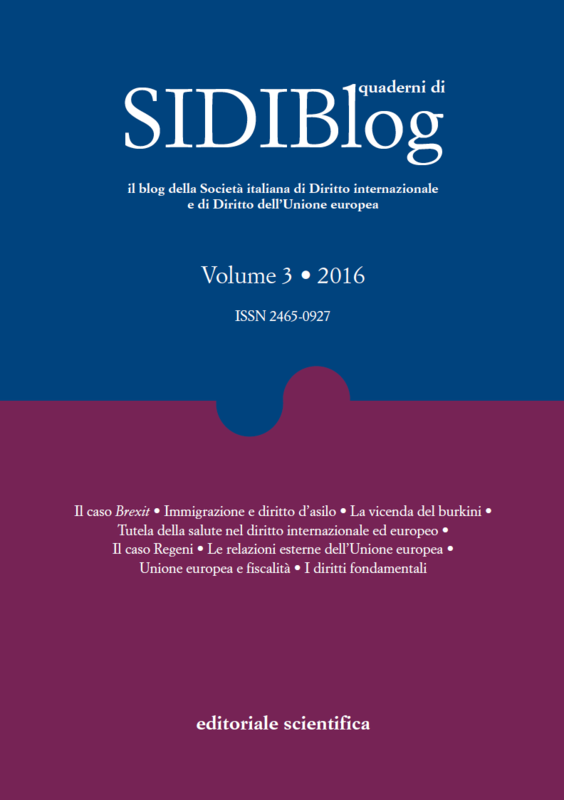 In fact, when exiting a treaty is merely the «ultimate act of disrespect for international rules and institutions» (Helfer 2005, ibidem), then revocation of this exit is no longer serving any plausible or legitimate interest, since it is not useful for an «extinction du différend par renonciation» (Capotorti, 572). On the other hand, withdrawals are much more abundant in international practice than one would expect: apparently, 1,546 instances of denunciation and withdrawal from 5,416 multilateral agreements were registered with the UN between 1945 until 2004 (Helfer 2012, at 644). And this also says something about the existence of a customary rule providing a real resistance of treaties to be (partially) terminated, especially if they expressly provide for withdrawal. This being said, we can now turn to Article 50 TEU, and to the specific withdrawal discipline it provides for. In Article 50 TEU revocation of withdrawal is not expressly prohibited; but neither is it expressly allowed. In essence, withdrawal is an option available to any Member State, provided it is done «in accordance with its own constitutional requirements» (Article 50.1 TEU). No motivation is needed, nor any objection to withdrawal is available for the Union, its institutions or any other Member State, unless based on the alleged invalidity of the withdrawal for breach of ‘constitutional requirements’ (an apparently remote option). The immediate effect of a notification of a Member State’s intention to withdraw from the Union is the opening of a negotiation between that State and the Union aimed at «setting out the arrangements for its withdrawal, taking account of the framework for its future relationship with the Union» (Article 50.2 TEU). This agreement is meant to replace the existing relationship between the withdrawing State and the Union. But if no such agreement is found within a two-years period (possibly extended if so unanimously decided by the European Council and the exiting Member State), then exit occurs without any such agreement, and «[t]he Treaties shall cease to apply to the State in question» (Article 50.3 TEU). Unlike other treaties, within the EU it is inconceivable to consider exit as an attribute to enhance cooperation among Member States, thus entitling any of them to use withdrawal (and it possible revocation) as a strategic tool to amend the Treaties. This would be inconsistent with the principle of sincere cooperation established in Article 4.3 TEU, and with the institutional setting of the EU, characterised by institutions where negotiations and possible amendments to the Treaties are done exclusively within the EU. A striking precedent has been experienced on occasion of the ‘euro crisis’, in which amendments – both internal and external to the EU legal order (such as the Fiscal Compact and the ESM Treaty) – have been anyway negotiated within the European Council, and with the contribution of the other EU institutions. By the same token, the UK had been given an option already to amend in its favour the existing rules governing the relationship among EU Members: the (mistaken) Settlement for the United Kingdom within the European Union represented the unique chance for the UK to abandon the idea of Brexit. It was rejected by the referendum of June 23, and is now irrevocably off the table. Apart from the probable inconsistencies of this Settlement with EU primary law, in any event it would be hardly persuasive if, once this chance has been missed by the UK, the latter would be still able to notify exit and then consider revoking withdrawal from the Union. The rationale of article 50 seems quite straightforward: the Treaty trades a full right to exit with an obligation to negotiate terms and conditions of an agreement, whose possible non-achievement leads to a “hard exit”. The two-year notice period is instrumental to permit both negotiating parties to prepare and discipline the post-exit situation, this being consistent with (a) the extreme complexity of terminating the membership of a State with the Union, and (b) the need of trying to agree on a regime applicable to the millions of individuals and firms affected by withdrawal. In such a situation, there cannot be any room for interpreting the notice period as an interval for allowing the withdrawing party to review its position during negotiations, depending on their development or likely outcome. Inter alia, this would be tantamount to leave to such party a unilateral say on the enormous amount and importance of rights and interests pertaining to the situations (a) and (b) above. Moreover, it would bias the negotiations envisaged by Article 50.2 TEU, against the principle of equality of arms among negotiating States, the paramount obligation of good faith in performing treaties referred to above, and its corollary duty of cooperation as described by the ICJ in the Gabčikovo-Nagymaros judgment. Besides, the imbalance would be to the detriment of the non-withdrawing Member States as well as of the Union, i.e. those who will be suffering the exit without being responsible for this. No doubt a taste of injustice would be added to this already sad situation. Finally, one must consider that withdrawal does not prevent a former EU member to rejoin: under Article 50.5 TEU «[i]f a State which has withdrawn from the Union asks to rejoin, its request shall be subject to the procedure referred to in Article 49». Again, this provision arguably sets a clear regime for avoiding that the Union is a revolving-door organization. As long as a Member State is in, it is more than welcome. But when it decides (to its full liberty, discretion and satisfaction) that it wishes to withdraw, then its position becomes identical to that of any other candidate to join the Union, and the decision to have it in depends upon the agreed procedures set by the TEU, establishing the agreement of national and EU parliaments, the other EU political institutions, and eventually all Member States. On the other hand, if I were wrong about non-revocability of withdrawal, then any other Member State would be entitled to threaten exit, notify it to the European Council, open negotiations under Article 50.2 and seek to enhance its position within the Union by using “strategically” the withdrawal option. Yet, such opportunistic behaviour of a Member State to (threaten) exit, with a view to changing rules that it previously accepted as binding, would be the end of the Union, even prior to be incompatible with numerous fundamental principles and provisions of the EU law. In order to try to persuade British and EU stakeholders that withdrawal from the Union by the UK would not be such a disastrous and sorrowful decision, many have started suggesting that Brexit would be a “Hotel California”-like situation, in which you can check-out any time you like, but you can never leave. Revocation of withdrawal seems to serve the same purpose. In my humble view, I do not think that this should be fostered: the UK has not yet notified its withdrawal; behind the curtains of political declarations, it may be possible that, within the UK, people are seriously considering to undo Brexit before it is formally there. Yet, one should make clear that, once withdrawal is notified, it will be a point of no return. This is the only way to permit that such a grave event for Europe will be decided taking full responsibility therefor, as it must be. I simply want to tell you that I am beginner to blogs and really enjoyed your web-site. Probably I’m likely to bookmark your site . You definitely have really good stories. Thank you for revealing your blog. Fantastic site you have here but I was wanting to know if you knew of any user discussion forums that cover the same topics discussed in this article? I’d really love to be a part of community where I can get feed-back from other experienced people that share the same interest. If you have any recommendations, please let me know. Many thanks! I just want to say I’m newbie to blogging and site-building and honestly liked this web-site. Very likely I’m going to bookmark your blog . You really come with really good well written articles. Thanks a lot for revealing your blog. hello there and thank you for your information â€“ I have definitely picked up something new from right here. I did however expertise some technical points using this site, as I experienced to reload the website a lot of times previous to I could get it to load properly. I had been wondering if your hosting is OK? Not that I’m complaining, but slow loading instances times will very frequently affect your placement in google and can damage your high quality score if advertising and marketing with Adwords. Anyway I am adding this RSS to my e-mail and could look out for a lot more of your respective interesting content. Make sure you update this again soon..
A powerful share, I simply given this onto a colleague who was doing a little bit analysis on this. And he actually bought me breakfast as a result of I discovered it for him.. smile. So let me reword that: Thnx for the deal with! But yeah Thnkx for spending the time to debate this, I feel strongly about it and love reading extra on this topic. If attainable, as you change into expertise, would you thoughts updating your blog with more particulars? It is extremely helpful for me. Large thumb up for this blog post! So the saying “You can’t have your cake and eat it too” may mean that you can’t eat the cake and then eat it again; or less metaphorically, that what you want is unreasonable. I conceive other website owners should take this site as an example , very clean and excellent user pleasant layout. I just want to tell you that I’m beginner to blogging and truly savored you’re web site. Almost certainly I’m want to bookmark your blog post . You surely come with superb writings. With thanks for sharing with us your website page. I just want to tell you that I am just all new to blogging and site-building and certainly savored your web blog. Very likely I’m likely to bookmark your blog post . You certainly have awesome article content. Bless you for sharing your web site.